As promised, bacon jam is good in everything. But it is especially good in this. 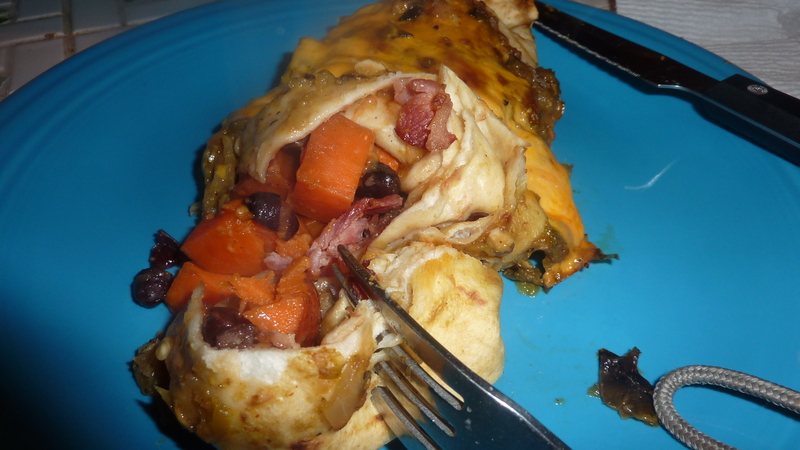 This spin off of Taco Bell’s Mexican pizza takes the concept to a whole new level. The sweet and savory bacon-y goodness of the bacon jam works well with the smokey heat of the chipotle, the oozing, creamy cheddar and mozzarella cheese, the brine-y olives, and the bright and fresh tomatoes. 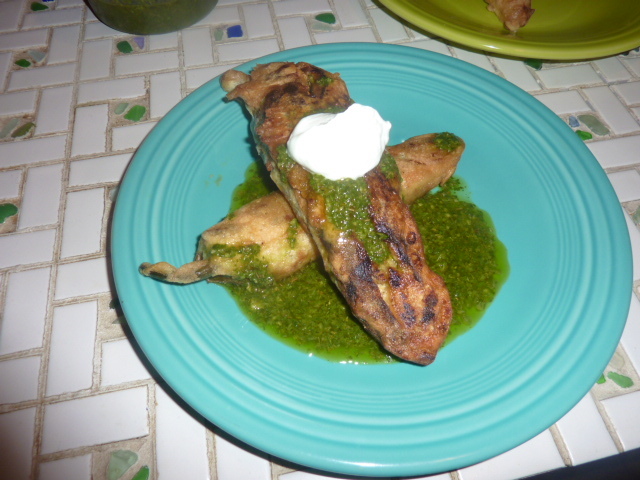 The hardest part of this whole recipe was flipping tortillas, but the flavors are bold, bright, and beyond delicious. If you are going to reheat this dish, do so in the oven or a toaster over, because it remains delicious in a goop-y mess but part of the appeal here is the crispy tortilla shells book ending the soft but textured jam and cheesy topping. On a large griddle or in a cast iron pan, heat oil over medium-high heat. Add tortillas and cook, flipping frequently, until crispy and golden brown. Place tortilla on a tinfoil lined baking sheet. Place bacon jam on the tortilla and, using the back of a spoon, spread into an even layer, leaving about 1/2″ on the edges uncovered. Sprinkle a few tablespoons of the cheese over the bacon jam. Add the second tortilla on top. Spoon the chipotle with adobo sauce in a smooth layer, leaving about 1/2″ on the edge uncovered. 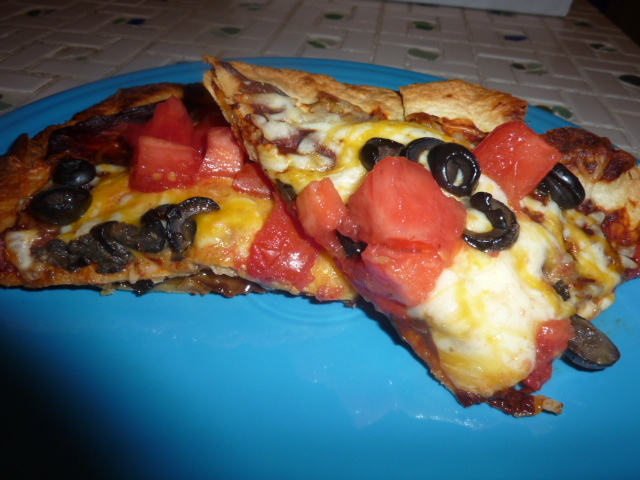 Top with remaining cheese and olives. Transfer to oven. 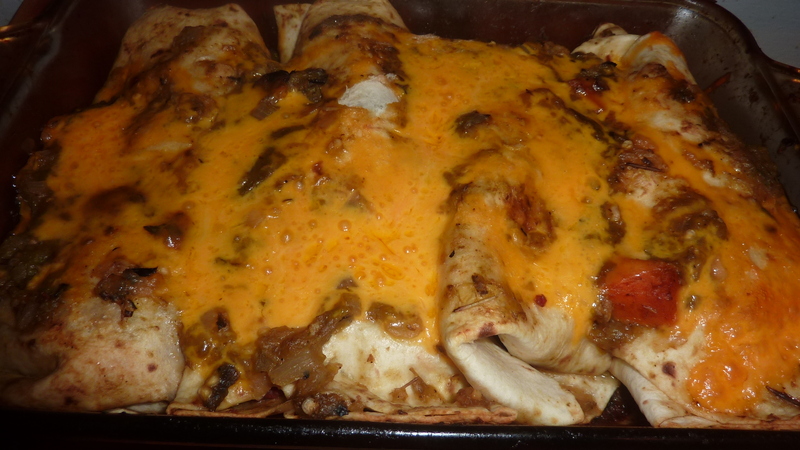 Bake about 15-20 minutes until cheese is melted and bubbly and center is heated through. Top with tomato. Cut into quarters and serve immediately. Thanks to a suggestion in the comments, I remembered I had this recipe bookmarked in my “To Try” list. I had every ingredient for this except the cilantro (because, hey, fresh herbs do not last that long) and exactly the right amount of ears of corn. Kismet! And I am so glad I had that reminder, because this was ridiculously good. We ate this side dish alongside some simple black bean burritos, eating it as-is and also as a sort of warm “salsa” on the burrito. Both were extremely good. The sharp feta contrasts perfectly with the sweetness of the warm caramelized corn, and the mayonnaise creates a creamy sauce that is to die for. The heat from the jalapeños and crushed red pepper flakes works well with the sweet corn and creamy feta and mayonnaise, bolstered by the bright, fresh cilantro, lime, and scallions. 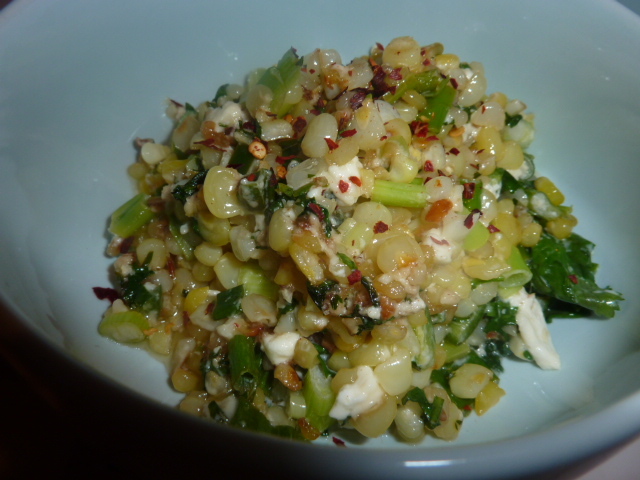 I will definitely be making this again the next time we receive corn in our CSA with no changes other than the fact that I want to double or even triple the recipe. As an update, I just wanted to acknowledge that I made this dish again with ingredients from Week Four of the CSA. Because we were bringing it as a side dish to a friend’s house, I decided to serve it cold. And it was frickin’ delicious both room temperature and cold. I also added about half a cup of halved cherry tomatoes, which was a great addition that added both color and flavor. Heat oil in a large non-stick skillet or wok over high heat until shimmering. Add corn kernels and season to taste with salt. Toss once or twice and cook, without moving, until charred on one side, about 2 minutes. Toss corn, stir, and cook, again without moving, until charred on second side, another 2 minutes. Continue tossing and charring until well charred all over, for a total of about 8-10 minutes. Add remaining ingredients and toss to combine. Taste for seasonings and adjust as necessary. Serve immediately. I’ve made this soup a couple of times now, and each time we enjoy it more than the last. It is excellent both with and without noodles – the long, springy enoki’s add enough of a “noodle-y” texture, but it’s definitely pumped up to a full meal with the addition of the ramen. This soup is reminiscent of a simple miso soup, but the added fire-y heat of the sriracha and plethora of meaty mushrooms makes it more interesting and more substantial. This soup is incredibly easy and the “hardest” part is separating all the mushrooms from one another. Mostly, you just boil water and throw a bunch of ingredients in a stock pot. Still, the deep umami of the dashi, miso, and mushrooms, spice of the sriracha, fresh crunch of the scallions, and wonderful textures of the mushrooms combine in a way that makes this soup taste like it should have been a lot more work than it was. The unique combination of flavors and textures is addictive, leading to inevitably licked-clean bowls. In a medium sauce pan, bring water to a rolling boil. Whisk in dashi and miso until no more clumps remain. Cover and reduce to a simmer. In a large sauce pan, heat oil over medium heat. Add onions and cook until translucent, about 2 minutes. Add mushrooms, soy sauce, and sriracha. Stir well to distribute the soy sauce and sriracha. Cook 3-4 minutes until mushrooms and beginning to tender. Carefully add chunks of silken tofu. Pour miso-dashi broth over the tofu and mushrooms. Bring to a simmer over medium heat. 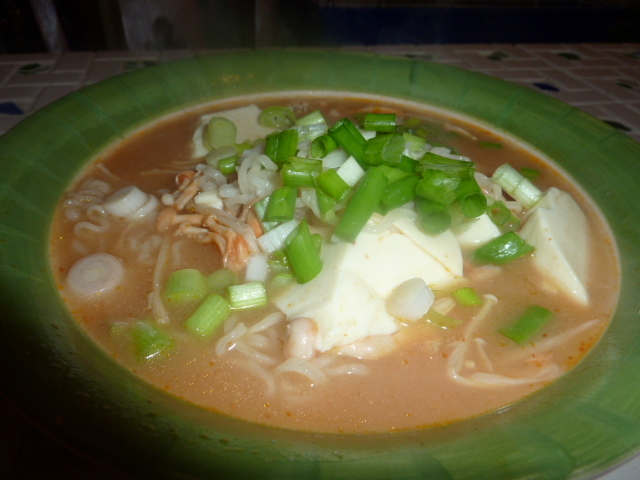 Serve immediately, placing cooked ramen noodles in the bowl first and ladeling soup over. Garnish with scallions.